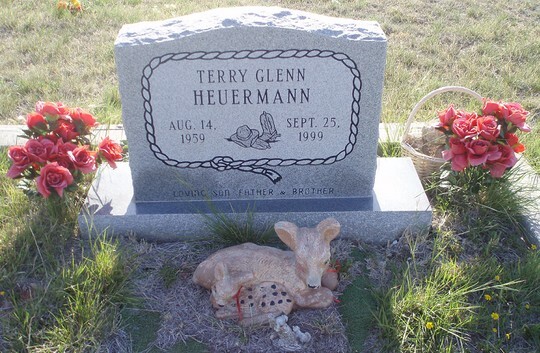 Terry Glenn Heuermann, 40, died Saturday, September 25, 1999, in a local hospital. Services will be Monday at 2 p.m. in Broadview Baptist Church with the Rev. David Cason officiating. Burial will be in Dewey Cemetery, directed by Fry-Bartlett Funeral Home. Mr. Heuermann was born in Winters and lived in South Taylor County most of his life. He graduated from Jim Ned High School in 1977. He worked for Midas Muffler and Brake shops for 20 years, including two years each as general manager for Midas stores in Wichita Falls and Lancaster, and general manager for the Abilene store since 1994. He was a member of Heritage Baptist Church in Abilene. Survivors include three sons, Michael Heuermann, Stetson Heuermann and Austin Heuermann, all of Abilene; two daughters, Samantha Heuermann of Lawn and Cheyenne Heuermann of Abilene; his parents, Roy and Alta Heuermann of Ovalo; a brother, Gary Heuermann of Merkel; four sisters, Lorraine Graham of Tuscola, Melva Dean Hamner of Potosi, Marietta McWhorter of Rochester and Glenda Jo Newberry of Abilene; and two grandchildren. Visitation will be today from 4-6 p.m. at the funeral home. Memorials may be made to Dewey Cemetery Fund, c/o First State Bank, Tuscola 79562.